Ulysses Grant was the greatest Union hero of the Civil War. His hard-nosed fighting style won him the nickname "Unconditional Surrender Grant. He was the author of the great Union victory at Vicksburg, which irrevocably altered the course of the war. After proving to President Abraham Lincoln that he had the courage to take the fight to the Confederates, Grant was elevated to an exalted militaryrank of General of the Army, a rank previously held only by George Washington. Incredibly popular with his men, Grant was a general the soldiers were willing to fight and die for. In a defining momentof our nation's history, he accepted Confederate General Robert E. Lee's surrender at Appomattox, ending the Civil War. Meticulously designed by American Mint - in conjunction with The National Civil War Museum - for the Sesquicentennial of the Civil War, this set of three remarkable coins commemorates the strength and honor of the Union's greatest general. 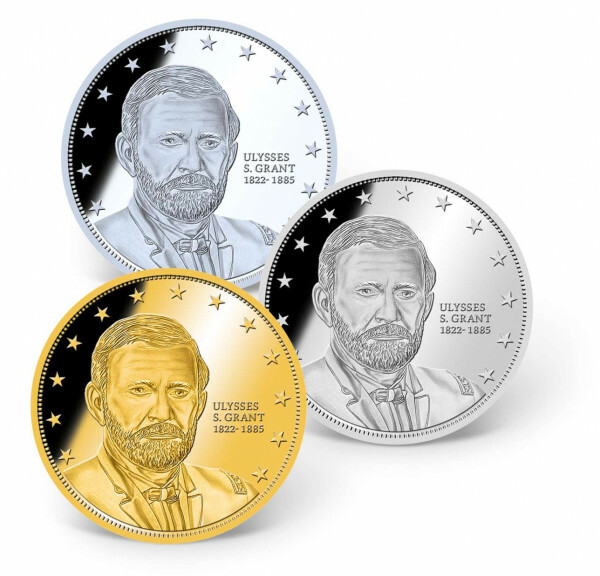 Each coin features a highly detailedimage of Ulysses S. Grant on the obverse and is exquisitely layered in a precious metal: one in 24k gold, one in .999 pure silver, and one in pure platinum! These coins are minted to the highest quality "Proof standard and come in a beautiful wooden collector box, custom crafted to preserve and display your precious coins for generations to come - a true collector's item.